I love getting out and about, seeing new things and meeting new people. There's a few fun things happening in the city this weekend so I just thought I'd post them here so you all can make some plans and come on out! 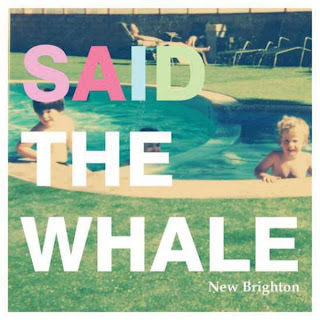 Said The Whale are playing at This Aint Hollywood. They are an awesome Vancouver based Indie band. They played at the 2011 Super Crawl and just killed it. Show starts at 8pm and cover is $15. All Ages. Art Crawl. For those of you not familiar with Art Crawl (GASP! ), it happens the second Friday of every month, year round. All the stores and galleries on James North stay open late, and you can mosey on down at your own pace and check everything out. It's a great night, even more so when the weather cooperates, and definitely worth checking out. Bring a canned good to James North and Cannon this Friday night and help out your community! 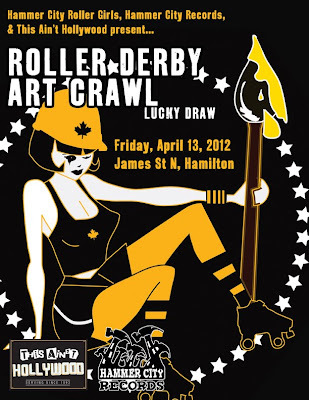 The Hammer City Roller Girls are having an event to kick off their 2012 season. Come and check out some awesome Roller Girl-inspired art at This Aint Hollywood and Hammer City Records, meet the girls and get yourself some awesome HCRG gear. 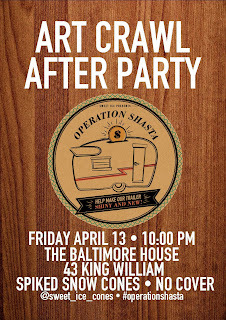 Art Crawl After Party with Sweet Ice Snow Cones at the Baltimore House kicks off at 10pm. The lovely girls from Sweet Ice are currently holding a fundraiser to raise money to revamp their trailer and make it snow cone friendly (support their efforts here). The after party will feature some amazing alcoholic snow cones (Apple Jack, Daiquiri and Margarita flavors!) and cover is free. It's going to be a rockin' good time, and the boozey snow cones have been approved by me. White Elephant's girl's night. But it's kind of a private party. We will be the loud ones. However, if it wasn't going to be an epic girl's night, I would be going to Haunted Hamilton's Downtown Ghost Walk. HH takes you through the most haunted areas and buildings of our great city, and it's always a fun night. Tour meets in front of the Connaught Hotel and starts at 8pm. $13 for adults, $5 for kids and $25 for couples. Bundle up! This is what I will be doing this weekend! What are your plans? Hope to see you out and about. What and where and why.